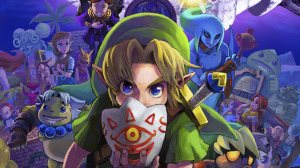 Gossip Stone: Would You Like To See A Majora’s Mask 3D Master Quest? As many know already, November’s Nintendo Direct held the unforeseen announcement of The Legend of Zelda: Majora’s Mask 3D at the beginning of the Direct. Now, being two months since then, we’re only left to speculate what kinds of additions and changes were made to the remake. Addition-wise, there’s a lot they can do with the game, ranging from new quests, to new items, or just nifty little features. But do you think they’ll take the same route that Ocarina of Time 3D took, and make a Majora’s Mask 3D Master Quest? If so, would you be satisfied with it? Check out more after the jump! What do you think? Would you like to see a Majora’s Mask 3D Master Quest? Or do you think the game would be better off without it? What other additions would you like to see in the 3D remake? And, what do you think the New 3DS-exclusive features will be? Amiibo, perhaps? Sound off in the comments!